You can keep lost weight off. Most media coverage about weight loss these days is about how hard it is to lose weight. There are many confusing reports about what one needs to do to lose weight. And, even if you’ve been successful at losing weight, there’s no shortage of stories about how difficult it is to keep lost weight off. There are many more successful weight-loss stories than you might think. That’s why, contrary to popular media, in this post I’m sharing how 10,000+ people lost weight and kept it off! Read about it, or watch my cool, hand-drawn animations in the video above. If you want to succeed at something, find someone who has already been successful and copy them. While everyone has different bodies and different circumstances, there is something to be learned from this very large group of people who have been successful. If you’re on a weight-loss path, you may find some of these practices worth copying. These successful losers started their weight loss with simple lifestyle changes and made the habits stick. It’s a compelling reason to begin a weight-loss path with habits that are sustainable and complementary to your life and health. They are the over 10,000 participants in the National Weight Control Registry (NWCR). They maintained their weight loss for an average of 5-1/2 years. Thirteen percent have maintained their weight loss for more than 10 years. By the way, data from the NWCR shows that if you keep the weight off for more than 5 years, you reduce your risk of putting it back on again by a whopping 70 percent. About half of them were overweight as a child. Almost 75 percent have at least one obese parent. With genetics and family history stacked against them, they transformed their bodies anyway. What did most of these participants do, and continue to do, to be successful? This information goes against the trends in today’s pop culture, but this is real-life data that supports a healthy, long-term lifestyle transformation. Eighty-nine percent succeeded through diet and exercise together. 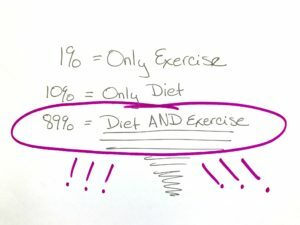 Only 1 percent lost weight using only exercise; 10 percent lost weight with diet only. from a commercial program, physician, or nutritionist- a professional like myself. were to restrict foods (things like cookies, chips, French fries, and soda), limit the amount of food they ate, and count calories. eating out at restaurants on average only 2-1/2 meals per week and eat less than one meal per week at a a fast-food restaurant. every day, typically cereal with fruit. on average 1 hour out of every 24. (That’s less than 5 percent of your day! It’s equal to one-third of an NFL football game, or half a season premiere of Dancing with the Stars!) 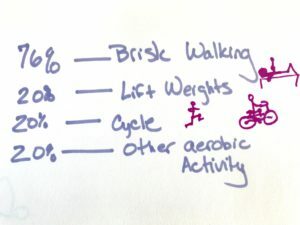 Seventy percent do brisk walking, 20 percent lift weights, 20 percent cycle, and 20 percent do some other kind of aerobics. And if you know me, I recommend cardiovascular exercise and weights for your optimal body. Seventy-Six percent do brisk walking, twenty percent lift weights, twenty percent cycle, twenty percent do some other kind of aerobics…And if you know me, you know I recommend cardiovascular exercise and weights for your optimal body. which means they sit less and move more. Seventy-five percent weigh themselves about once per week. 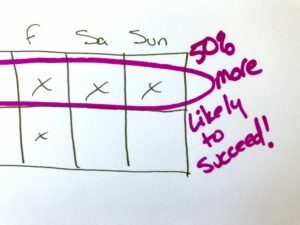 Researchers believe this may be helpful for them to correct any missteps if they start to veer off track. with these healthy habits have been 1 and 1/2 times more likely to keep the weight off over the years than those who are strict with their habits on weekdays and relax them on weekends. Maintaining healthy habits over the holidays has also shown to help prevent relapse. 7. Continue until your new practices become habit and an easy part of your life. By the way, if you’re interested in having me as your coach to guide you through small steps to your optimal body and lifestyle, peers who are on the same path, and a program that’s personalized to your body and lifestyle, check out my 6-week program –coming soon. 2. Long-term weight loss maintenance. Wing, R., & Phelan, S. The American Journal of Clinical Nutrition, (2005); 82(1): 222S. 3. Dietary habits and weight maintenance success in high versus low exercisers in the National Weight Control Registry. Lorraine G. Ogden, PhD, Suzanne Phelan, PhD, J. Graham Thomas, PhD, James O Hill, PhD, Rena R. Wing, PhD, and Holly R. Wyatt, MD. J Phys Act Health. 2014 Nov; 11(8): 1540–1548. 4. Are the Eating and Exercise Habits of Successful Weight Losers Changing? Phelan, S., Wyatt, H., Hill, J., & Wing, R. (2006). Obesity, 14(4). That you put out is very helpful!! Have a heart of gold to help people and it shows through you! Jon, Thank you so much for following my blog and videos. It’s great to have you here, and I’m enjoying watching you flourish with your exercise and diet!